One question we are frequently asked is: Why did we choose the rigid cam tensioning method over the more typical spring-loaded design? In order to answer this question, we have to look at the system as a whole. What we are after in the end is accurate control of the flow of material through the orifice of the print head. Since this is an open loop system, we want our mechanical response to be as stiff as possible. The plant of the entire extruder system is dependent on many variables, most of which are not worth considering for this topic. But in general, the more directly we can convert a change in stepper motor torque to a change in hot end melt pressure, the more accurately we will be able to control the flow of material through the orifice. With the Flexion Extruder design, we haven’t eliminated the spring loaded arm, we’ve just drastically increased the spring constant (since any mechanical system has some compliance). As the extruder makes rapid directional changes, the nip rollers experience transverse forces. The stiff spring constant of the Flexion arm results in less deflection and a more direct conversion of the stepper torque to axial force on the filament. This feature, combined with the short, low-friction, fully-supported filament path are responsible for the drastic improvements in performance that our users commonly report. However, what we sacrifice with this design is a the ability to accommodate filaments with poor tolerances on diameter. But given that diameter variation directly impacts print quality, this is actually not much of a sacrifice. I used to work for a filament manufacturer. Our customers typically required a diameter tolerance of 1.75mm +/- .05mm. This was easily achievable on a modern extrusion line with laser gauging. However, because the volume is dependent on the square of diameter, even this fairly tight tolerancing results in a 12% allowable volume variation. If you’ve spent time dialing-in the extrusion multiplier on your printer, you know that this is a huge deviation. This is why most high-quality filament suppliers target an even tighter spec on diameter variation, especially within a single spool. Although lot-to-lot variation may be greater, so it is important to measure your filament diameter and adjust your extrusion multiplier every time you make a material change (if you care about dimensional accuracy of your print). 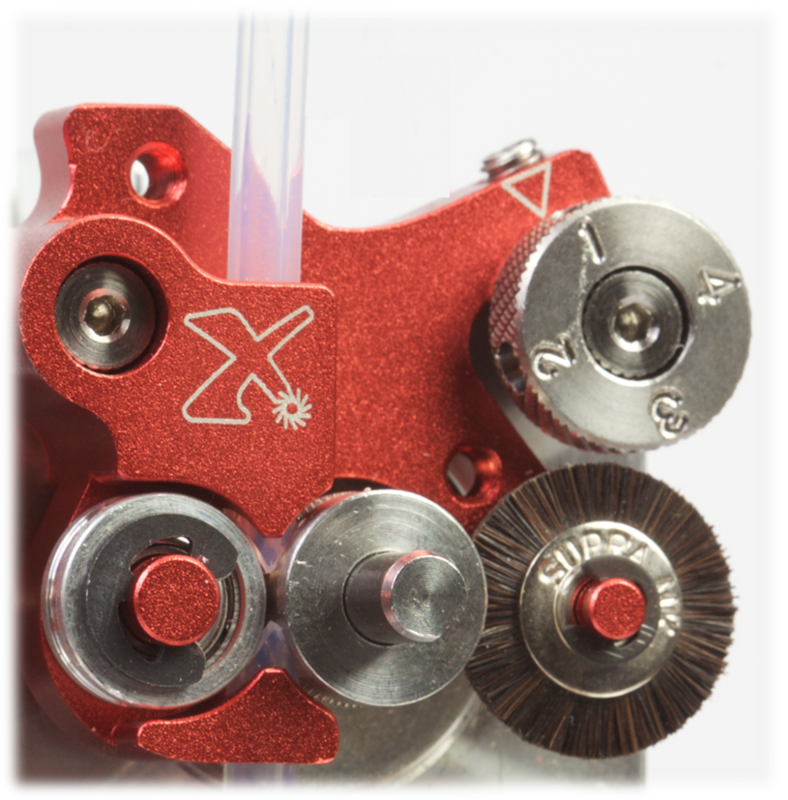 The Flexion drive rollers are machined with very sharp teeth. Even on hard filaments like PLA, we get ~0.2mm of tooth engagement with the filament. So, for high-quality filaments, this allows for plenty of room for the minimal diameter variations that may arise. However it does also require some fine-tune adjustment of the cam follower set screw. This can be difficult at first, but you’ll quickly get a feel for it. Keep in mind that the M4 set screw has a 0.7mm pitch and the lever arm is approximately a 2:1 setup, so a full revolution of the screw will result in ~0.35mm of compression. So, when you’re trying to dial in your setup for a rigid filament, changes of <⅛ turn can make the difference. The softer the material, the more forgiving it will be. Also, early on, we had some reports of the set screw loosening due to vibration over time. All units now ship with threadlocker on the set screw. This makes it slightly more difficult to feel the amount of compression you’re getting. Another option is to purchase our anti-vibration jam nut with longer set screw. We don’t include this in the standard kit because it can be confusing for beginners to use.